Managing Editor Daniel M. Reck welcomes you to the 2013 National Scout Jamboree. Like the jamboree itself, Jamboree Today is rooted in a rich history. Since 1937, we have operated like any other traditional news service. We have a newsroom filled with editors scouring the details of stories submitted by reporters roving the jamboree. As always, our staff is a mix of experienced media professionals and Scout reporters, who enter as energetic novices and emerge from the jamboree as legitimately published journalists themselves. At Fort A.P. Hill, we had the “all-Eagle delivery patrol,” who assured your paper copy of Jamboree Today appeared in your campsite daily by 5:30 a.m. In 2010, we celebrated each morning by updating a big sign in the newsroom counting the number of consecutive on-time deliveries by this team of Eagle Scouts. The record covered decades of jamborees. Now, Jamboree Today is delivered instantly to the phone in your pocket, the tablet in your daypack and your computer at home. No longer will stories come out in a single eight-page edition at 5:30 a.m. each day. Instead, the news will appear here as it happens. The news will also be a lot more colorful as we feature more outstanding images from our staff of talented photographers and videographers. So visit jamboreetoday.org often. Also find us on the official jamboree app for iOS and Android, Facebook, Google+, Twitter, Tumblr and other social networks to join with other readers in sharing the goings-on. Leading the charge to this new all-digital Jamboree Today is Stephen Shore, our publisher. He has an extensive background in the publishing and marketing industries. PC Magazine, MacUser, PC World Online, internet.com, and InformationWeek all found success with Stephen’s leadership. He is now the chief executive for STADIS Corporation in Dallas, Texas, which is a leader in web marketing services. Jamboree Today is pleased to welcome Stephen to guide our family, with his professional experience as well as his long time contributions to Scouting. He is a recipient of the Silver Beaver Award among other recognitions from the Boy Scouts of America. Stephen has assembled a new team for Jamboree Today, selecting outstanding professionals, Scouts, and Venturers from around the nation. Jamboree Today‘s staff also includes several returning staff members, including our managing editor, Daniel M. Reck. An Eagle Scout, Daniel was our international editor at the 2011 World Scout Jamboree in Sweden and was a copy editor at the 2010 National Scout Jamboree at Fort A.P. Hill, Va. There, he helped start Jamboree Today‘s digital transition and covered Scouts’ adoption of social media at the jamboree. Daniel’s experience includes seventeen years as creative director at forzandoArts, a media company that specializes in helping non-profit organizations and artists establish their web presences and publishes music and photography. He is also a university administrator, directing web media for the Northwestern University bands. Daniel’s photography of college athletics has been selected by the Smithsonian Institution in Washington, D.C., to be included in a national exhibit showcasing how communities unite around their local sports teams. Finally, we hope that you, our readers, will contribute to Jamboree Today. 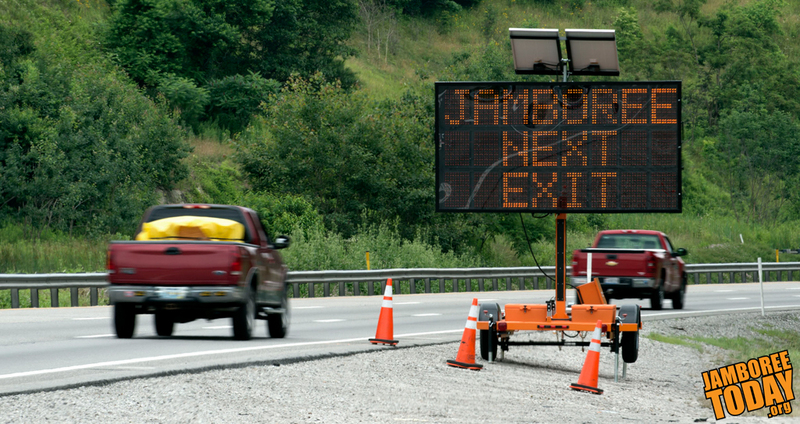 As the jamboree story unfolds around you, we invite you to capture it in images and text that you can submit at jamboreetoday.org. You can also drop us a line or send us photos on all of the social networks. The Summit will bring us all many new adventures. With your help, we will work to weave a tapestry illustrating the first jamboree in these beautiful 70,000 acres. So, as the brochure says, get ready to go big and get wild! When you do, show us.